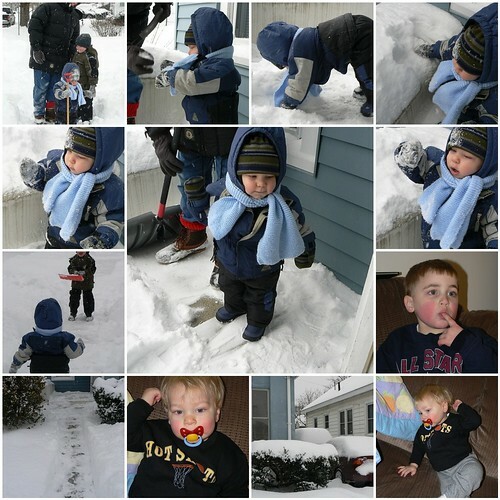 Please note: This was the little guy’s first time in the snow on his own to play and explore the wonders of snow. Happy Holidays! He’s so stinkin’ adorable! Nothin’ beats a bundled up kid, so cute! Looks like a white Christmas for you. How cute! I just love all these pics today of kiddos in the snow and bundled up like little penguins. Merry Christmas! Love the snow pictures. We have lots of snow too for Christmas and more on the way today. Merry Christmas and happy WW to you! I just want to squeeze those cute little cheeks!!! Great wordless wednesday. I love how you stacked the pictures!! I have to learn to do that… my posts turn out so long sometimes and it drives me crazy. Oh he looks like he is having a good time figuring out what that white stuff on the ground is.